Have you ever had one of those days where you just do something completely impulsive? I have those days quite often. Especially now that I don't keep any lists anymore. So a few weeks back, I just had one of those days where I could NOT look at the color of my front door anymore. When we moved into our house six years ago, we painted the entire thing. It had been kind of a greyish brownish bleahish color before, and the door was salmon pink. 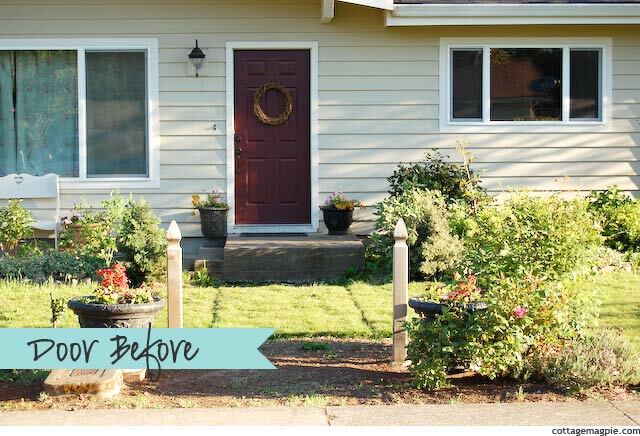 You can kind of see it in the listing photos in this story about how we bought the house, although I think the listing agent blocked the door on purpose in the photo! I was going for that pretty robin's egg blue door like I made in my digital makeover of the front of the house. Once I settle on a color, I will have to get the right kind of paint and do a proper job, but for now it's happy and cheerful, and that makes me happy. Of course, now Mr. Magpie is saying we should paint it red. Ha! What color is your door?